Statutes of limitations set the maximum period within which a criminal or civil action can be brought against an alleged offender. While promoting fairness and efficiency in investigative and judicial proceedings, they can also hamper effective prosecution of offences if they are overly short or do not provide for sufficient flexibility. Statutes of limitations can lead to the impunity of alleged offenders, particularly for corruption offences that often only come to light after a long passage of time. In addition, cross-border corruption cases are often a long process, as international legal cooperation can be slow. 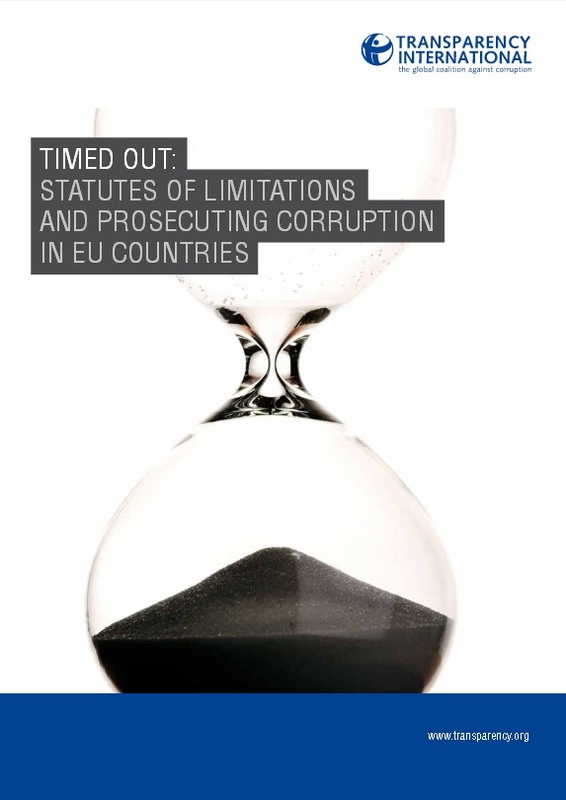 Transparency International has carried out comparative research across the European Union including Ireland to assess the relevance of statutes of limitations in the fight against corruption. To identify both weaknesses and best practices in statutes of limitations, the research examines the situation in 27 EU countries. Based on the results of the research, Transparency International will advocate for best practices to be adopted where needed. There is a lack of statistical data regarding the number of cases that are closed as a result of statute of limitations. This report was published with support from the Prevention of and Fight against Crime Programme of the European Union, European Commission - Directorate-General Home Affairs.